It's a Friday, so I am not going to blog about free Autodesk technology previews that you can try. Instead, I am going to share some fun facts about where I live. Despite the glut of fake news on Facebook, I was able to unearth much of this information via a Facebook group dedicated to the city where I live. I was then able to verify it with sources from friends and the Alameda Museum. My wife and I live in a homeowner association called Crown Harbor in Alameda. 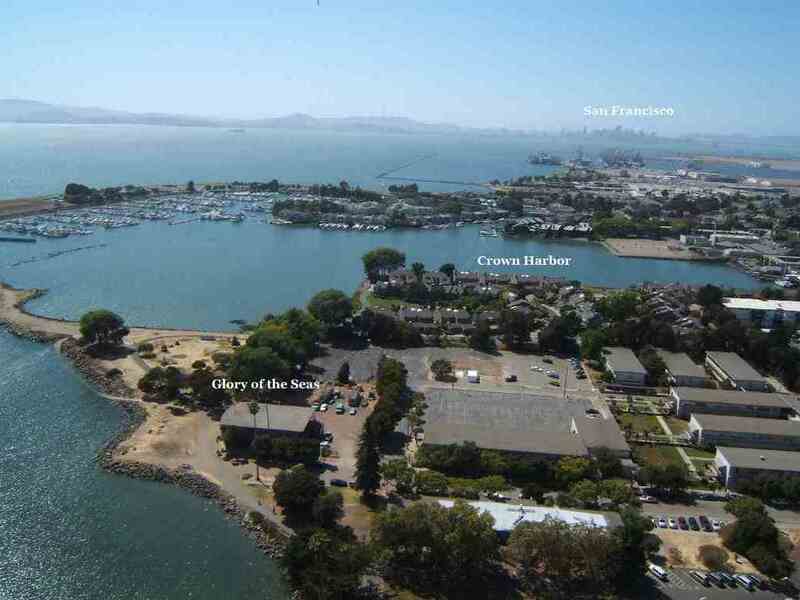 Crown Harbor is a small gated Alameda California community of 76 townhomes nestled along Ballena Bay, Crab Cove, and Crown Beach. Crown Harbor is a quiet, well-kept community on the San Francisco Bay, close to downtown Alameda's Historic Webster Street shopping, restaurants, post office, twice-weekly Farmers' Market, and much-anticipated seasonal events such as Concerts at Crab Cove, 4th of July Parade, and Neptune Beach Community Celebration. Alameda Hospital is less than two miles away. 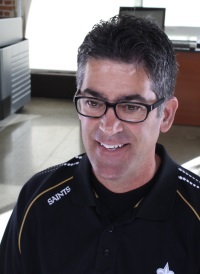 Crown Harbor is only ten minutes away from Oakland's world-famous Jack London Square. San Francisco is a fifteen-minute ferry ride away. World-renown wineries in Napa Valley and Sonoma County are less than an hour away with award-winning Rock Wall winery less than ten minutes from Crown Harbor. So here are some fun facts that I learned about the history of the site where Crown Harbor exists today. Crown Harbor is located adjacent to Crab Cove. Crab Cove is now a tide pool/marine life education center that is part of the East Bay Regional Parks District; however, the site was originally a maritime training facility. Google Map of Crown Harbor Today with overlay of where Neptune Beach used to be. Crab Cove is the site formerly known as Neptune Beach, where both the American snow cone and the popsicle were first sold in 1923. The name comes from Frank "Pop" Epperson who sold his Epperson Ice Pop known as "Pop's Sickle." 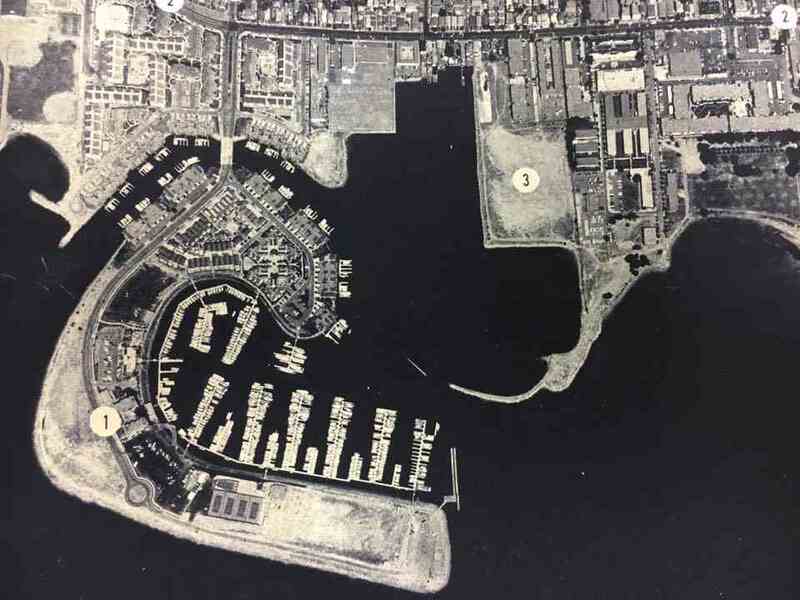 Crown Harbor is also located near Neptune Court which depicts resort life in Alameda in the 1920's to this day. It is the only part of Neptune Beach that remains. 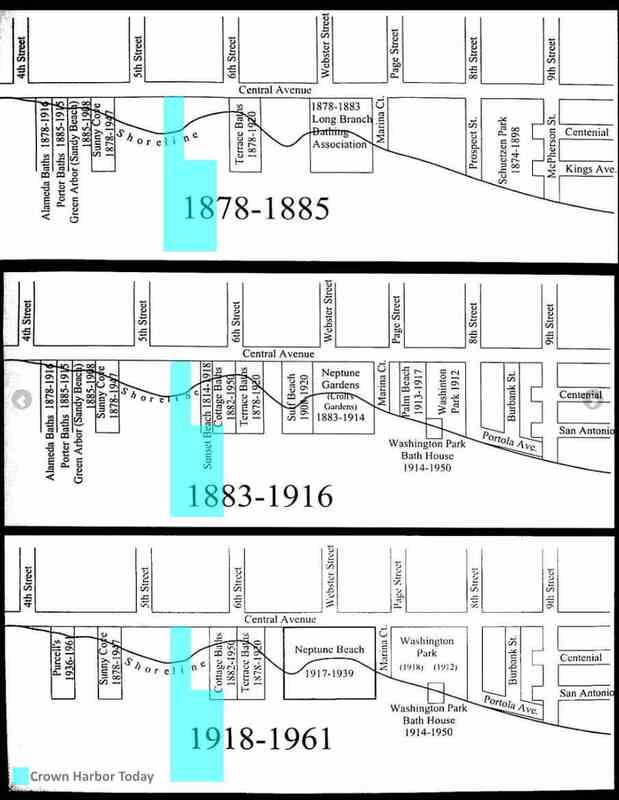 1878-1885 Baths Map from the Alameda Sun with an approximation of where Crown Harbor exists today. Established in 1878, the Sunny Cove Baths were located at 456 Central Avenue which is now the site of Paden School. Also established in 1878, the Alameda Baths were located at 448 Central Avenue which is also now the site of Paden School. Crown Harbor gets its name from its proximity to Crown Beach. 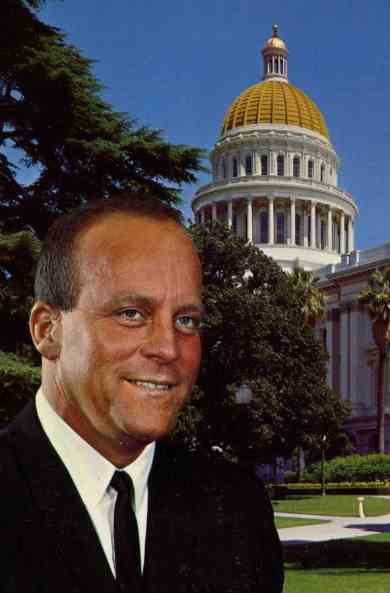 Assemblyman Crown was killed when he was struck by a vehicle while crossing the street. Thanks to Steve Sorensen for the map. Local history is alive in the lab.